We’ve all heard these supposed solutions for mental health problems, usually from those don’t fully understand how serious such illnesses can be. And while I believe it’s important that we’re educated on the difference between a normal level of worry and an anxiety disorder, or sadness and depression, for example, there’s no doubt mental health should be taken seriously. It needs to be treated with much more than a throwaway comment. If it was as simple as going outside, a lot of problems would be solved. As someone who has generalised anxiety disorder (GAD), I’m well aware how frustrating these suggestions are. I manage my anxiety with techniques I learnt from cognitive behavioral therapy, plus a number of other self-care practices, like paying attention to what my body and brain need, which is usually plenty of food, water and sleep. (That makes it sound very straightforward, but on the worst days even leaving my bedroom is an achievement.) I also say no to anything that can set me off and doesn’t have any benefits, such as coffee, which makes me far too jittery for the energy boost to be worth it. 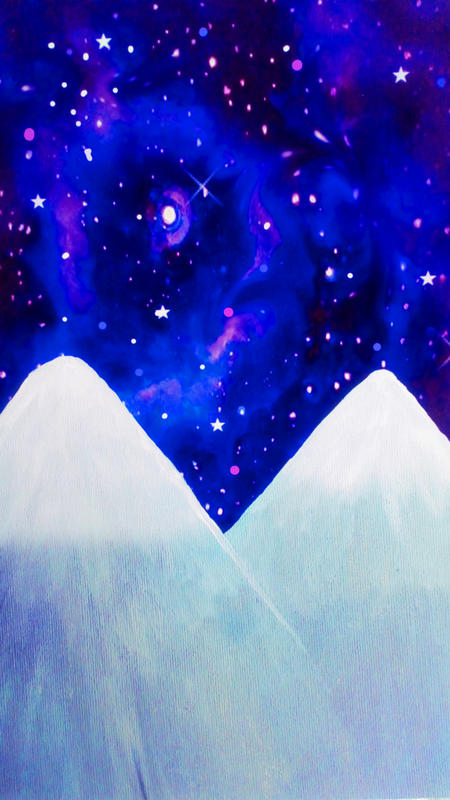 This starry mountain top print is by the lovely and talented Jemma from Dorkface Shop. I started going to a yoga class about six or seven months ago. I didn’t see it as a way of looking after myself at that point — I just wanted to find something to do in the area I’d movedto. I was bored, lonely, and sick of deleting emails from Meet Up mistakenly suggesting I should join groups for divorced people. I’ve ended up loving yoga because it calms me down. I walk into the studio, take off my shoes, grab bricks, a belt and a bolster, then settle down on the mat and wait for instruction. And something wonderful happens: I don’t think about anything except what’s happening in the studio. Part of it is down to the environment. The women and men in my class are all ages, sizes and races. No one is in competition with each other because our bodies all move in different ways. We’re doing what we can, whatever that might be on the day. In some classes I can stretch myself out into a pretty flexible downward dog. In others, the fact I’m there is enough. And that’s the beauty of it for me. I’m so focused on what I’m doing, I don’t have the time to panic, get stressed, or overthink an awkward moment from the last week (or the last decade). It doesn’t matter if it looks pretty, because it’s not a performance. I can just be on the mat and do something that serves me, and only me, without any worry. It’s the best gift I can be given. Have you tried yoga before? Does it work for you? Let me know. Mental health charity Mind has a lot of useful information about anxiety disorders, including symptoms, self care, treatments, and useful contacts. YouTube channel Yoga With Adriene posts free videos for all levels and concerns. I found it especially useful when I was a complete beginner and wanted to feel more comfortable before my first real-world class. Adriene emphasizes the importance of being kind to yourself and finding what feels good. I’m not a medical professional and this post isn’t meant to be advisory in any way; it’s nothing more than a personal account. GAD can vary hugely from person to person, and my experiences might not reflect someone else’s.